Take home your favorite animal! The Zoo offers three gift shops, two located in the U.S. Bank Gathering Place and one in the West Entrance. 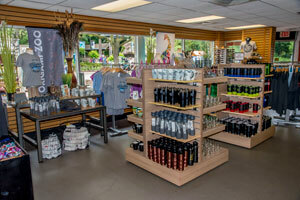 Stop in at any of the gift shops either at the beginning or end of your Zoo trip. You’ll also find merchandise for sale throughout Zoo grounds. To purchase gift cards, call 414-771-3040. The Karibu and Flamingo Gift Shops offer a variety of plush animals, many of which you’ll see during your visit! Located in the U.S. Bank Gathering Place, both gift shops offer toys, stylish apparel and popular souvenir keepsakes that will be the perfect reminder of your visit to the Milwaukee County Zoo! The Milwaukee County Zoo’s newest gift shop is otter this world! Located near the Otter Passage Exhibit, this gift shop offers a selection of otter merchandise, a variety of plush toys and other souvenirs to take home as a reminder of your visit to the Zoo!